In my last blog I wrote about meal plans and why I do not think they work. Calorie counting is often another so called ‘tool’ that many people try to use to lose weight. Meal plans and calorie counting are often used in conjunction but many people have a target calorie number they are trying to stay under and try to count their calories throughout the day. Counting macros, meaning tracking carbohydrate fat, protein, not just calories is also popular right now. Just like I do not believe meal plans work for the majority of people who attempt them, I also do not think calorie counting works. A calorie is a unit to measure energy. The actual scientific definition of a calorie according to the Webster Dictionary is the amount of heat required at a pressure of one atmosphere to raise the temperature of one gram of water one degree Celsius that is equal to about 4.19 joules or the simple definition, a unit of heat used to indicate the amount of energy that foods will produce in the human body. Calculating calories in food used to be a fairly intensive process. The particular food was placed in a container called a bomb calorimeter, surrounded by water and then sealed. The food was then completely burned and the rise in water temperature was measured. As you can see this was in a completely controlled lab environment. As you can see the process is either very scientific done in controlled lab settings or somewhat of a guessing game using estimations and averages. A calorie is a calorie and all you have to do to lose weight is to eat less than you consume. It’s just simple math. All calories are not created equal. 150 calories from a chicken breast is very different than 150 calories from a candy bar. You should never eat below 1500 calories because that is what is needed to maintain basic daily functioning. You need at least 2000 calories a day. Just like most nutrition and exercise beliefs, you can probably find lots of articles and/or research supporting and disputing all of these statements. And we wonder why most people are confused and overwhelmed with nutrition and exercise. Which leads me back to my point of why I do not think calorie counting works. Well, for the most part, it is basically impossible to do correctly. How big was that apple you ate? How much salad dressing was on the salad? Did you cook the chicken in 1 tbsp of oil at home or order it in a restaurant where it was most likely prepared with a lot more oil. Did any of the oil burn off? Did you remember to count the few pieces of candy you ate during the day? What about that stick of gum? Does that have calories and does it count? So much time and energy for inaccuracy that does not guarantee results. Just like why I will never support any diet book/plan that touts one single meal plan for everyone, the concept that calorie needs are the same for even similar sized people is inaccurate in my mind. Needs vary so much from person to person and even from day to day for the same person! Calorie needs are mostly based on gender, age, weight, height and current activity level. But other factors play a role such as ‘current nutritional needs’ meaning are you pregnant or nursing? Do you have some type of sickness or disease? Are you taking any medications that affect metabolism? Almost all of the factors cannot be changed but activity level can obviously change from day to day. So how can a meal plan or ‘program’ say we need x amount of calories when maybe one day we run 8 miles and the next day is a rest day? You could also eat the exact same amount of calories as a friend who is your same gender, age, weight, height and activity level and get totally different results! Everyone’s genetics and hormones play a role too! I also personally think that calorie counting often creates a bit of anxiety, frustration and for some people can become a bit obsessive. Now, remember, I DID IT FOR YEARS! Just like trying to follow meal plans, it helped me feel in control. I have a Type A personality. I like numbers, I like schedules, I like control. I felt that if I did not write down what I ate or try to figure out how many calories I consumed that I would be out of control. I felt it was something I could control. But over the years a lot has changed and I realized I could never really be accurate and I realized it did not get me ANY results! I do not want to put my energy into that anymore. I want to eat healthy but find a way to do that is enjoyable and sustainable and makes me feel my best. I just cannot spend that much time worrying about how many calories are in the polenta and shrimp entree I had at this new breakfast spot I tried this past weekend (it was delicious by the way!) For years, I would honestly order the ‘healthiest’ thing on the menu. I would rarely and I mean rarely order what I wanted unless it was a very special occasion. Yes, for real, I would be willing to spend a lot of money going out to eat to order what I considered the healthiest thing (that I could probably make at home for a lot less). Now, don’t get me wrong, I am not saying that we should order a double bacon cheeseburger and large french fry every time we go out to eat. But I rarely go out, and I enjoy restaurants that serve fresh and healthy food in the first place and I want to order something I enjoy vs. ordering something based on how many calories I think are in the dish. It is very liberating to finally go to a restaurant and order what sounds good and not be obsessed how many carbs it had in it. There was no way to tell anyway so I might as well enjoy it! 5 years ago I would have never ordered the shrimp and polenta dish as I would have been freaked out about the carbs in the polenta. I still make conscious choices as eating good whole foods makes me feel the best but I no longer feel guilty for ordering what I want on a menu. 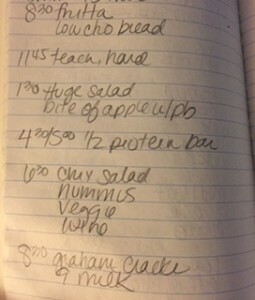 Picture of one of my many food journals when I was trying to track calories in the past. I also think that trying to count calories or macros just like trying to follow meal plans, does not allow us to eat mindfully or figure out what is working for us. If you are so concerned about eating a certain amount of macros or calories each day, are you thinking about how that food makes you feel? How are your hunger levels? What about your energy levels? Are your cravings out of whack? If you are consistently always hungry it might not mean you are not eating enough calories but maybe not enough nutrient dense and satisfying foods. You might be hitting your ‘target’ calories but exhausted all the time or cravings are out of control. How about focus on whole foods that you enjoy, keep your energy levels up, cravings in check, satisfied and gives you the results you want? Now, the few times I do think calorie counting might have a place in this world is if you are under a medically supervised diet for a certain condition or perhaps if you are training for something very intense (ultra-marathon, Ironman triathlon) etc. In this case you will definitely need to make sure you are consuming enough calories to support these hours of exercise. However, for recreational athletes pursuing these events, I think you could figure out what you need nutritionally by paying attention to how you are recovering, you energy during workouts and you overall performance. I do not think you need to calculate every single calorie in and out. I also think that if you are not seeing results, journaling your food for a few days can give you a good snapshot of your daily nutrition habits. Maybe you did not realize how many liquid calories you were consuming. So I do think that can be helpful at certain times. Because I do not necessarily believe in counting calories does not mean that I think you should not read nutrition labels. I hope that most of us eat majority of our foods that do not come with nutrition labels but of course most of us eat some sort of packaged foods. I think you should most pay attention to the ingredients and what is in the food you and your children are consuming. To me that is by far the most important and then I look at the macronutrients. I still look at calories, fat, protein and carbohydrates. I pay most attention to sugar as I think that tends to be by far the what most people in this country over consume. I think paying attention to what you eat is obviously so important but I think we need to pay attention as a whole what we are putting in our body vs. exactly how many calories or how many grams of carbs or protein or fat we are consuming. But most important, find out what works for you!